One of the largest aircraft building facilities in Russia, the Samara Aviation Factory sprang up after the German advance in 1941 forced the evacuation of a plant in the city of Voronezh. In its new incarnation, the factory was to become a record-breaking producer of Ilyushin attack planes and a vital part of the victory in WWII, as well as the post-war Soviet aviation industry. The Second World War was the defining milestone in the development of the Russian aircraft industry. As a consequence of large-scale evacuations of industrial enterprises from the west of the country, which was vulnerable to air strikes and direct invasion by German troops, aircraft building plants sprang up in new locations. One of these was the Samara Aviation Factory, one of the largest in Russia today, founded in 1941, when the site of the modern workshops and hangars was only a sun-scorched steppe in the Volga region. The Samara works were born of the Voronezh aircraft factory, built in 1932 during the first Five-Year Plan. On the eve of the war, it was already a well-established production center that manufactured around a dozen types of aircraft. Up to 1941, its assembly lines turned out hundreds of Ilyushin Il-2 aircraft, the famous “flying tanks.” The outbreak of war demanded much speedier construction rates, and by that fall the factory was turning out 15 attack aircraft a day. However, it quickly became clear that Voronezh was not a secure site for the production of strategically important items for the front. On Oct. 1, the German Wehrmacht reached Kharkov, located only 150 miles south of Voronezh, prompting the government to urgently evacuate the plant deeper into the country. Kuibyshev, now called Samara, was chosen as a temporary location for the workshops and equipment, since it already had basic production facilities suitable for such an aircraft plant. Prison labor was used in the urgent installation of the assembly lines and the plant was already turning out its first aircraft that December. The factory retained its specialization and was mainly concentrated on production of the Il-2, which was in desperately short supply at the front. Losses of Soviet ground attack aircraft in the first months of the war were immense and were barely compensated for the defense industry during this restructuring period. The Kuibyshev plant initially built one plane a day, a rate the national leadership deemed as grossly insufficient. Stalin made plant directors personally responsible for performing at acceptable levels, and manufacture of the Il-2 increased dramatically as a result. During the war, Soviet factories produced more than 36,000 units, making the Il-2 the most mass-produced plane in history. A staggering 75 percent of the total came from the Kuibyshev plant. After the war, it was decided to leave the evacuated equipment where it was and to establish entirely new production in Voronezh. The Kuibyshev factory was then given the new assignment of developing strategic aircraft capable of carrying nuclear weapons and delivering nuclear strikes. 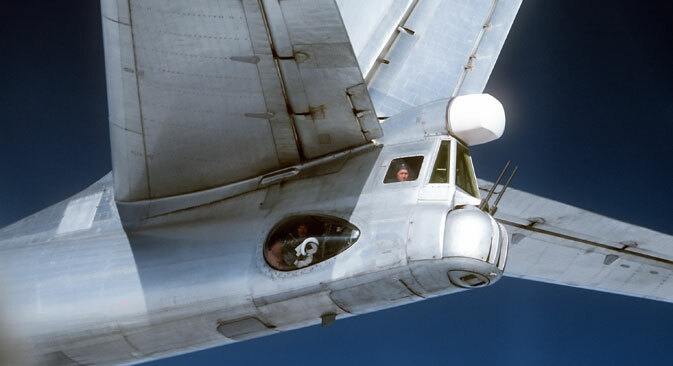 The mainstay of this type became the Tupolev aircraft series, and in 1949 the first Tu-4 rolled off the assembly line, a bomber created on the same pattern as the legendary American B-29 that dropped the atomic bombs on Hiroshima and Nagasaki. In 1954, this aircraft was used in the first field tests of the Soviet atomic bomb. In 1950s-1970s, the Kuibyshev aircraft builders perfected the Tupolev family of combat aircraft, including its next incarnation, the Tu-95, and this aircraft and its modifications were the backbone of the Soviet strategic air forces for decades. The Tu-95 platform was so versatile that it was also possible to use it to produce a purely civilian aircraft. The Tu-114 passenger plane, unique in never having an accident in over 20 years of operation, was an adapted version of the Tu-95. Such was the confidence in its reliability that in 1959 a Soviet government delegation headed by Nikita Khrushchev flew to Washington in a still untested Tu-114. In 1968, the Kuibyshev plant began mass-producing the Tu-154 passenger plane, which formed the bulk of the Soviet and then Russian civil aviation fleet for 30 years. Today, after the economic crisis of the 1990s, the company has made a good recovery, although many production elements had to be extensively restored and even rebuilt from scratch. While that work continues, prospects for new growth are steadily improving – a pilot project currently underway is the Antonov An-140, which is intended to serve as the basis of Russia’s future military transport aviation. In 2014, the question also arose about producing the Ilyushin Il-114 in Samara as the main aircraft for the country’s domestic airlines.